Designing the kitchen of Rachel's dreams to her very specific brief! 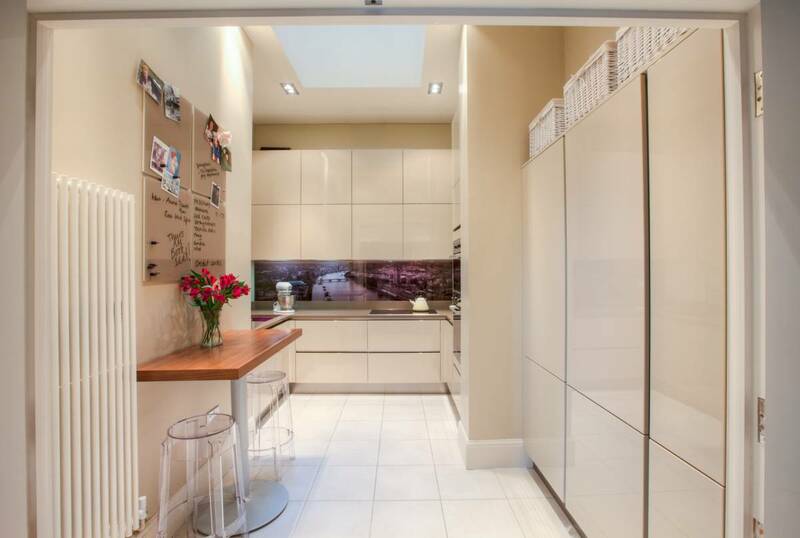 Modern, sleek kitchen packed full of storage solutions whilst still feeling spacious. To design a functional kitchen, for an exceptional home cook! With tons of storage and working in a small, tricky shaped room. It was really exciting to work with Rachel on designing her perfect kitchen. She wanted something that would be functional for her as a cook but also provide tons of storage. Her home is a flat in Tunbridge Wells, converted from an old mansion so the dimensions of the kitchen were tricky to work around as well. 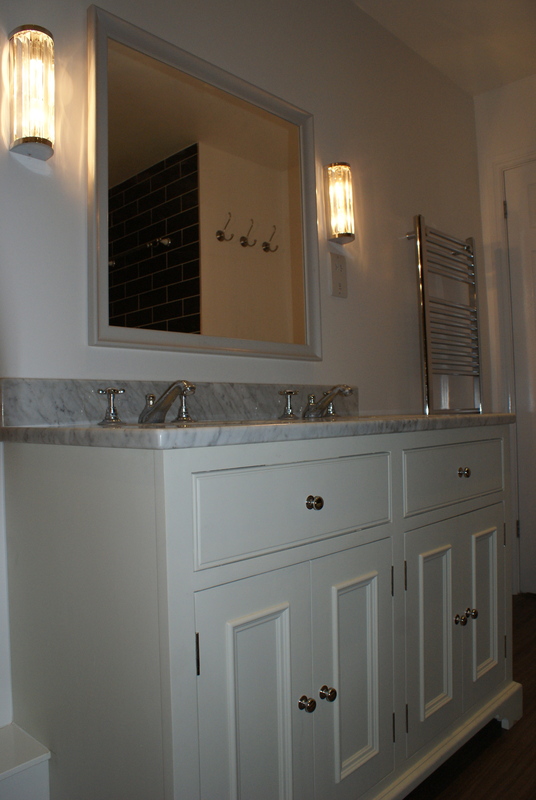 In order to keep maximise light and space in the room, I recommended she used gloss cabinets in this wonderfully warm cappuccino finish, and that the walls and all accessories tied in with this, to create a wonderful flow. She has all the functionality she can in the space, but it doesn’t feel cramped in at all. We even had the notice boards made in reflective glass in the same colour tones to give her a lovely personal display area that again tones in to the whole room. The large bank of cupboards on the right hand side are a full size freezer and fridge with a long cupboard to give even more storage. All the base units are drawers so work brilliantly for easy access to pans, and plates, with internal sliding drawers too for all the cutlery and cooking utensils to be kept with in easy reach. The breakfast bar has a hydraulic mechanism on it so it can be raised an lowered when needed – so it’s completely multifunctional, providing extra worktop space as well as space for dining. 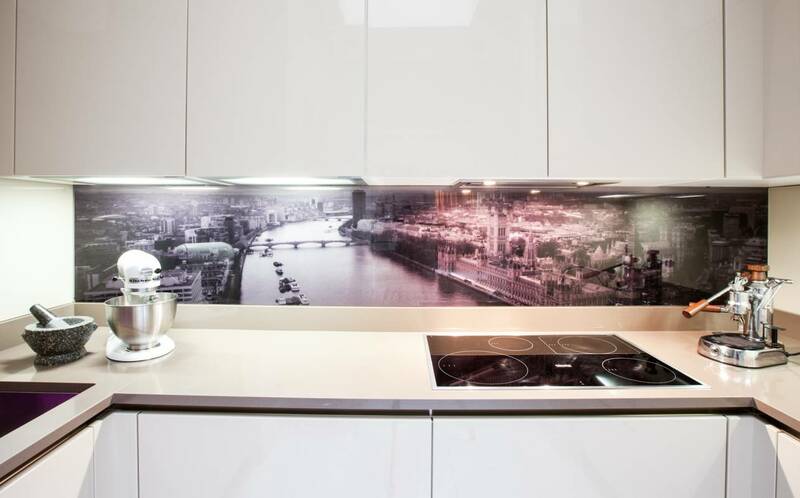 A real focal point to the room is the bespoke glass splash back, which has been back printed with a scene of London and the Thames – one of Rachel’s favourite views. I love how this makes the room personal but also gives it a unique and modern edge. 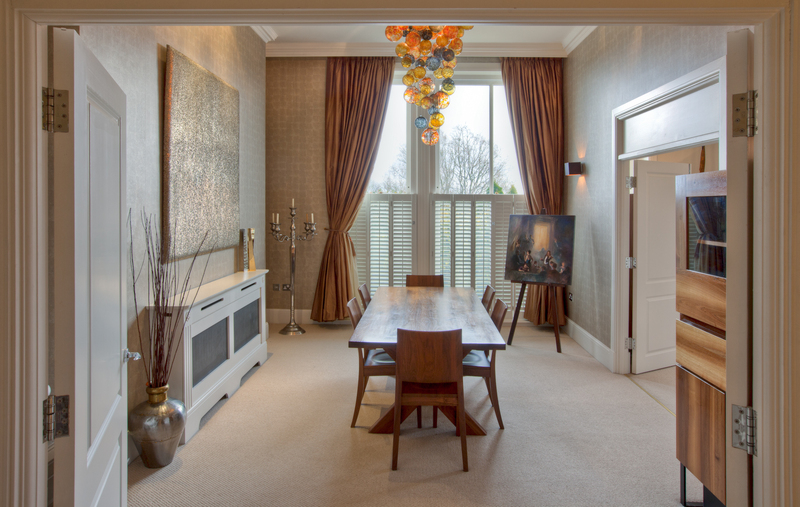 It also gives depth to the back wall and helps to make the room feel deeper due to the depth of the scene of the picture – a perfect play on a visual illusion!